Is an inventory build-up pushing up IIP? As usual, growth was led by consumer durables, but since July, capital goods have also shown a pickup, with the Capital Goods index going up by 12.8% in September. 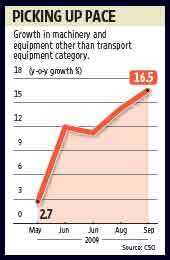 Growth in “machinery and equipment other than transport equipment" has also been a relatively high 11% during April-September. That seems to indicate an increase in investment demand. With low levels of capacity utilization in industry and with poor revenue growth for engineering companies in Q2 and poor execution by infrastructure companies during the last quarter, it’s difficult to see where the improvement in the capital goods sector is coming from. The big question is: what does the return of growth mean for the stimulus, both monetary and fiscal? A. Prasanna, senior economist with ICICI Securities Ltd, says the recent dismal showing in indirect taxes, taken in conjunction with good growth, is a strong argument for the government to withdraw its excise relief in the next budget. That will have obvious negative implications for companies. As far as the monetary stimulus is concerned, Gaurav Kapur, senior economist with ABN Amro Bank, points out that the lack of progress on the third generation telecom auction together with the weakness in indirect tax collections could have an impact on the government borrowing programme. But bond yields don’t reflect this, probably because the government is aware that appetite for further borrowing is limited, while the Reserve Bank of India tightening has already been factored in. The other point is the big difference between the tepid corporate numbers for the September quarter and the upbeat IIP figures. True, there has always been a disconnect between the IIP data and corporate performance. But this time, although sales growth in Q2 for the corporate sector was practically flat, the IIP data show good growth in production. One reason for the difference between sales and production could be restocking of inventory by firms. That may be fine if the restocking is just for the festival months. But the worry is: what happens if the final demand does not materialize?